NOFA RI advocates locally for Rhode Island Organics! 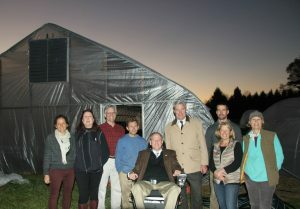 NOFA / RI Board Members with Senator Whitehouse and Representative Langevin for a hands-on farm tour at Brandon Family Farm in West Kingstown. To learn more about the current state of Labeling legislation for Genetically Modified Organisms (GMOs) or Genetic Engineering (GE), see the Organic Consumers Association and their action link here. Learn the basics of genetic engineering and biotech firms here. Opposition to the inclusion of hydro in organic certification is rapidly building. Some people are only now finding out that hydroponic is being allowed on a massive scale in organic certification. Most customers (and many farmers!) still have no idea. 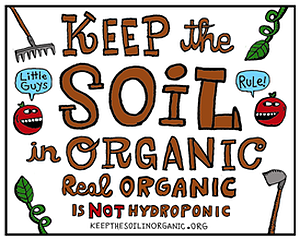 “It’s right in the law that the term organic means it enhances the health of the soil. If there’s no soil, how can you apply the term? It’s misleading to the consumer. It’s fine if they want to label the products as pesticide-free, but hydroponic growers shouldn’t be cashing in on the organic market.” And even more compelling is our growing understanding that real organic agriculture, by whatever name, is the only possible path to reversing climate change. At the very moment that the organic movement has a critical role to play in cooling our planet, the organic label is degenerating into a USDA “Almost Organic” label, losing its position of moral authority and leadership. Read more on this important topic here. Learn more about NOFA’s regional policy work here. View posts by the NOFA Interstate Council on Policy, Advocacy and GMOs/GEs here. View posts by the GMO-Free USA here and GMO-Free Connecticut here. View posts by the Center for Food Safety about Genetic Engineering (GE). View 11-year-old, Birke Baehr’s talk, “What’s Wrong With Our Food Supply? And How Can We Make a Difference?” explaining organic food benefits over GMOs here. View story on GMOs by The Campaign for Real Farming. View common crops likely to be GMO here. View GMO policy from CT NOFA here. View Advocacy policy of NOFA/Mass here. View Advocacy policy of NOFA-VT here. View Advocacy policy of NOFA-NY here. View National Organic Coalition (NOC) position papers. Contact your elected officials here: Senators and Representatives. For questions, email Mark Hengen, NOFA/RI Policy Committee member.